Three Parishes means Business is a FREE support package for businesses and community enterprises in Weston Rhyn, St Martins and Gobowen. Suitable for businesses at all stages in their development cycle, from the germ of an idea to businesses that have been established for many years, Three Parishes means Business aims to help local businesses access the support that they need to grow and thrive. We are offering FREE places on business training courses delivered at Qube in Oswestry. For details of the courses available or to book a free place, please contact Bridget on 01691 656882 or email b.laraway@qube-oca.org.uk. 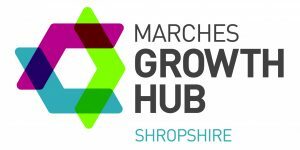 A wide range of training courses and other business events are organised by Marches Growth Hub, many of which are free of charge to attend. Three Parishes Means Business can cover travel expenses for local business people to attend these events. Please contact us to find out more. We have created a fund for grants and loans of up to £500 for small businesses that need a cash injection to take that next steps or for new businesses to help get off the ground. Co working is a great way for people who usually work on their own to occasionally share a workspace with others. Ideal for people who run their own home-based business, or anyone that is employed and works from home. Gobowen - Gobowen Central Library & Hub, St Martins Road, Gobowen. St Martins - St Martins Community Centre, Overton Road, St Martins. Weston Rhyn - Committee Room (Ground floor front), Weston Rhyn Village Institute, Bronygarth Road, Weston Rhyn. You are welcome to come for the full session, or just to drop in for a couple of hours. Use of the space is free and booking isn’t essential but it does help us to know how many people to expect. If you would like to book a place, please click on the date(s) above. Parking, wi-fi, tea, coffee and biscuits all provided. Bring your laptop and your lunch if you plan to stay all day! If you are interested in co-working but these dates don't suit you, please get in touch. For more information, or to book a place, please contact us. We would like to encourage local people to support local businesses and community enterprise, keeping more money in our local economy. We are considering a number of different ways that this could be achieved including a local market, a brochure of local businesses, an online directory of local businesses and a loyalty scheme. Please let us know if your business would be interested in taking part in one of these initiatives. Any developments in Three Parishes means Business will be updated on this website page, on our facebook page, and included in local village magazines. Please let us know if you would like to be added to our Three Parishes means Business mailing list (post and email). Please contact Bridget, Big Local Co-ordinator on 01691 656882 or by e-mail: b.laraway@qube-oca.org.uk if you would like to discuss your business needs.